While it is impossible to remove mycotoxins completely from foods and feeds, effective measures to decrease the risk of exposure depend on a rigorous program of monitoring mycotoxins in foods and feeds. Consequently, governments in many countries have set limits for permissible levels or tolerance levels for a number of mycotoxins in foods and feeds. Over 50 countries of the world have developed such guidelines (Van Egmond 2002). For example, levels varying from zero tolerance to 50 ppb have been set for total AFs. Other than AFs, a tolerance level of 1 ppm for DON in grains for human consumption has been set by a number of countries, including the United States. The FmB1 levels established by FDA in 2000 are limited to 5, 20, 60 100, 30, and 10 ppm, in corn and corn by-products to be used for horse and rabbit, catfish and swine, ruminants and mink, poultry, breeding stock (ruminant, poultry, and mink), and others (dogs and cats), respectively. Among 77 countries which have regulations for different mycotoxins, eight have specific regulations for OA, with limits ranging from 1 to 20 mg/kg in different foods. Regulatory guidelines to limit the presence of PT to 50 mg/kg in various foods and juices have been established by at least ten countries worldwide. Details on worldwide regulatory issues and permissive levels of mycotoxins in foods and feeds have appeared in a number of recent reviews (Park and Troxell 2002; Van Egmond 2002; Chu 2002). 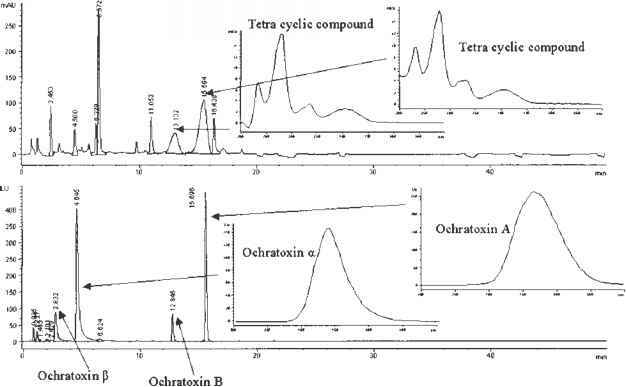 Because of the diverse chemical structures of mycotoxins, the presence of trace amounts of toxins in very complicated matrices that interfere with analysis, and the uneven distribution of the toxins in the sample, analysis of mycotoxins is a difficult task (Chu 1995; Coker 1998; Richard et al. 1993; Wilson et al. 1998). Because many steps are involved in the analysis, it is not uncommon that the analytical error can amount to 20-30% (Horwitz et al. 1993). To obtain reliable analytical data, an adequate sampling program and an accurate analytical method are both important (Whitaker et al. 1994; 1995; Wilson et al. 1998). To minimize the errors, studies have led to many improved and innovative analytical methods for mycotoxin analysis over the years (Chu 1991; Gilbert 1999; Maragos 1997). New, more sensitive TLC, HPLC, and GC techniques are now available. Sensitive and versatile high resolution MS and GC/tandem MS/MS are coming to the market. The MS methods have also been incorporated into HPLC systems. New chemical methods, including capillary electrophoresis and biosensors are emerging and have gained application for mycotoxin analysis (Maragos 1997). After a number of years of research, immunoassays have gained wide acceptance as analytical tools for mycotoxins in the last decade (Chu 2001). Antibodies against almost all the mycotoxins are now available. Some quantitative and qualitative immunoassays have been approved as AOAC methods. 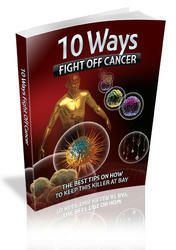 Many immunoscreening kits, which require less than 15 min. per test, are commercially available (Trucksess and Wood 1997). Rather than analysis of toxin, PCR methods, based on the primers of key enzymes involved in the biosynthesis of mycotoxins, have been introduced for the determination of toxicogenic fungi present in foods (Birzele et al. 2000; Edwards et al. 2001). Detailed protocols for mycotoxin analysis can be seen in several of the most recent reviews and books and the most recent edition of AOAC (Gilbert 1999; Trucksess and Pohland 2001; Van Dolah and Richard 1999). Dietary modification greatly affects the absorption, distribution, and metabolism of mycotoxin and subsequently affect its toxicity [reviewed in Bhatnagar et al. (2002)]. For example, the carcinogenic effect of AFB1 is affected by nutritional factors, dietary additives, and anticarcinogenic substances. Diet containing chemoprotective agents and antioxidants such as ascorbic acid, BHA, BHT, ethoxyquin, oltipraz, penta-acetyl geniposide, Kolaviron biflavonoids, and even green tea, have also been found to inhibit carcinogenesis caused by AFB1 in test animals. The toxic effect of OA and FmB to test animals was minimized when antioxidants such as vitamins C and E are added to the diet. Ascorbic acid also provided protective effect against AFs. Aspartame, which is partially effective in decreasing the nephrotoxic and genotoxic effects of OA, competes with OA for binding to serum albumin. L-phenylalanine was found to have some protective effect for the toxic effects of OA because it diminishing OA's inhibitory effect to some of enzymes discussed earlier. Most mycotoxins have a high affinity for hydrated sodium calcium aluminasilicate (HSCAS or NovaSil) and other related products. Diets containing NovaSil and related absorbers have been found effective in preventing absorption of AFB1 and several other mycotoxins in test animals, thus decreasing their toxicity [(see Bhatnagar et al. 2002; Huwig et al. 2001; Philips et al. 2002)]. Likewise, several other adsorbants such as zeolite, bentonite, and superactive charcoal have been found to be effective in decreasing the toxicity of other mycotoxins such as T-2 toxin.